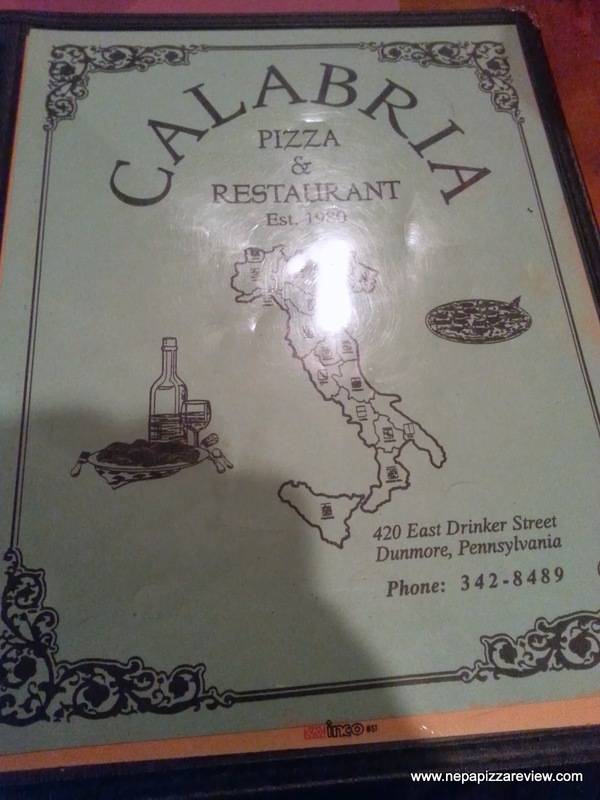 As I was saying in my previous review, my visit to Dunmore became a "Double Review" after a buddy of mine informed me that Calabria Pizza was just across the street from Colarusso's Pizza. I took my pizza to go from Colarusso's and fired up the pizza mobile for the long trek of about 47 feet to Calabria. The Colarusso's tomato and garlic old forge pizza was a success so I was hoping to strike gold twice in the same night. In pulling into Calabria, the parking situation struck me as a little strange and I wasn't sure which door to go into. I decided to take the back door which had a sign noting the dining room was down the hallway. When I got to the end of the hall I was still a bit confused because I found myself walking through tables of people who were chowing down enjoying their hefty portions of food. I plowed on to find a waitress toward the front of the restaurant in the 2nd dining area and she allowed me to sit wherever I decided - confusion cleared up! I passed by what looked to be a very nice looking New York style pie, and also spotted a tasty Old Forge on someone's table so I was torn as to what to order. I decided to get a little interactive with this review and I took to Twitter to ask for a suggestion. I decided the first person to tweet me back with a suggestion would dictate what I ordered. 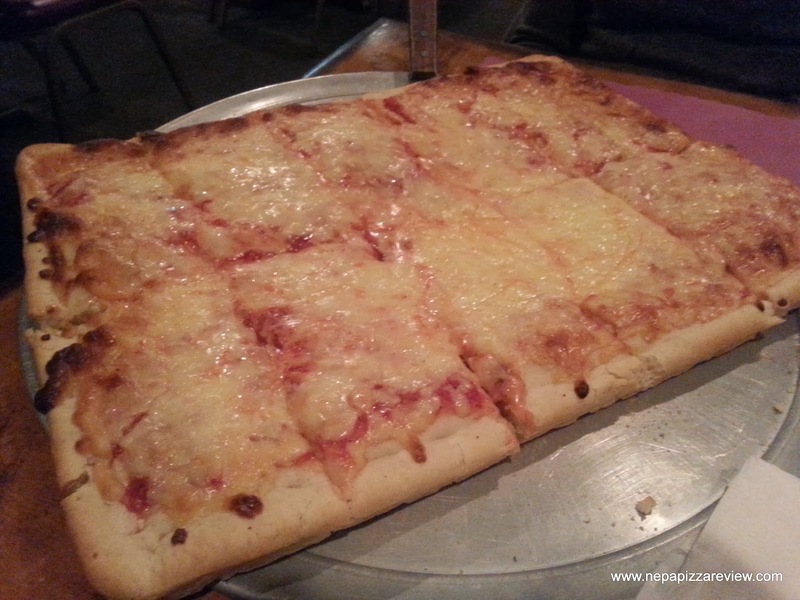 @bumperde hit me up right away suggesting the Old Forge just before the waitress came back, so that's what I ordered - a plain old forge red pizza. I hope to find new ways like this to make my reviews more interactive (let me know in the comments below if you have any suggestions)! After placing my order, I looked around noting that this place had about 20 tables, and a solid majority of them were filled on a night that I wouldn't expect places to be very busy. It was clear that there were a lot of regulars and Calabria's has a strong following. Hopefully that strong following translated into great pizza for me to try! The pizza was delivered to me in pretty short order, which was good because somehow I was still hungry even after sampling a couple Colarusso slices (so much for my New Year's Resolution!). My initial impression of the appearance of the pizza was that it was your typical old forge, and nothing really stuck out to me. The cheese was melted just as I like it - cooked all the way with only a little browning. The crust was quite thick and could have been a little darker, but overall this was a pretty standard looking Old Forge with no surprises. I took a peek under the hood to see that the underside of the crust was cooked thoroughly, although I would have liked some additional crisping (personal preference). I took the first bite and my taste buds sent me the signal that they wanted some more flavor. The crust was very thick, the American cheese on top didn't provide a lot of flavor, and the sauce didn't have a ton of punch to it. With such a thick crust, I'd like some contrasting flavors to balance out the pie. Adding some extra sauce or a topping might have corrected this problem, but I believe a great pie should stand on its own as far as balance. I actually like the sauce, but there just wasn't enough to balance this out, and the sauce was unevenly applied with some areas being dry, and some having what I would consider to be the correct amount. I was a little surprised that this sauce was not sweeter, because Dunmore pizza usually means SWEET pizza, but this wasn't overly sweet to me (which is a positive in my book). I must issue an ONION ALERT to those of you who don't like onions, because the sauce does contain some. 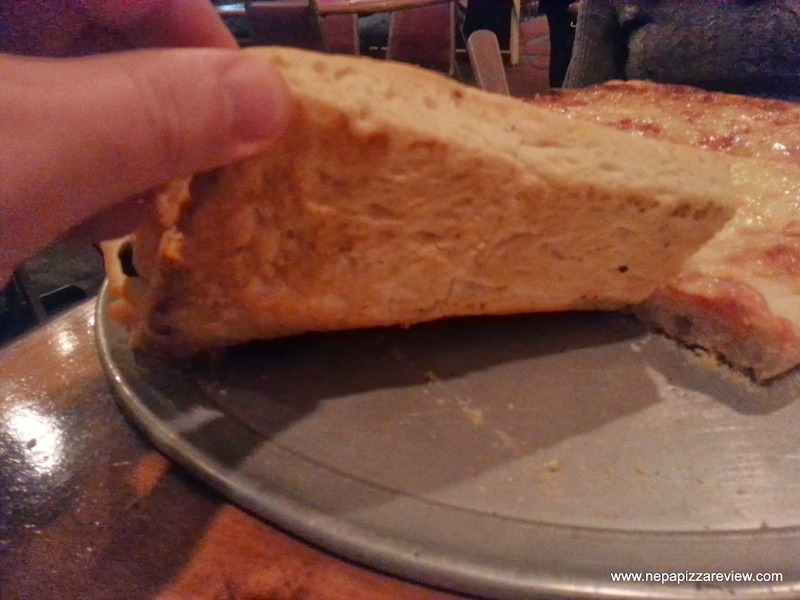 The crust in itself was pretty magnificent as far as how delicate, fluffy and tender it was. To infuse a little more flavor, I would add a little olive oil under the crust while cooking, or even brush a little around the edge. 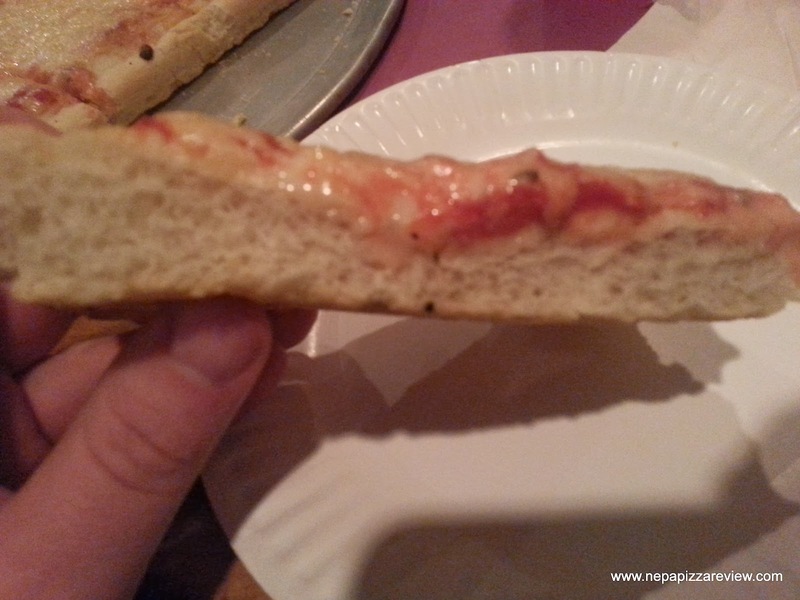 This would help balance the pizza out more and give this bread-like crust some character. I would also keep my suggestion to (if I was cooking this pizza for myself), because it seems that Calabria has a strong following and people will generally enjoy this pizza. In fact, I called one of my buddies (with a simpler set of taste buds) and recommended this pie to him immediately following the review. Overall, I have to call this a decent pizza which people will like. It didn't wow me with anything special, but I can see why people enjoy it. Next time I go, I look forward to trying the New York Style pizza and one of their monster-sized entrees that are priced on the value side of things! I wouldn't have any hesitation recommending this place to my readers.